Photo of serpentine rock © Michael Baird, shot near Cayucos, CA: The Franciscan Mélange at Estero Bluffs (used by permission). California has a greater number of minerals and a wider variety of rock types than does any other state. 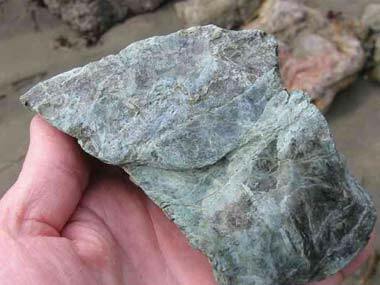 Serpentine is a shiny green and blue rock found throughout California. It contains the state's principal deposits of chromite, magnesite, and cinnabar.